According to Box Office Mojo, Rogue One: A Star Wars Story has now made Just shy of $499 million domestically, which puts it above Pixar's Finding Dory, which made $486 million during its run last summer. 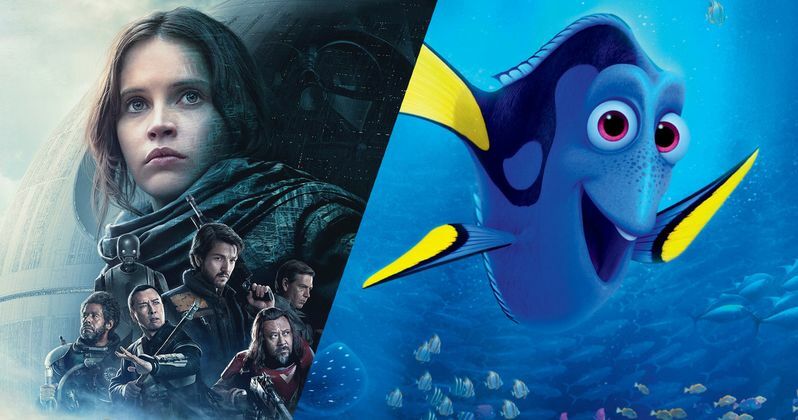 Finding Dory still has the latest Star Wars movie beat worldwide, but that will probably change soon. As of right now, Star Wars: Rogue One has made $979.9 million worldwide and Finding Dory finished up with $1.02 billion. At the end of the day, both of these movies are making more money for Disney, so nobody at the House of Mouse is complaining either way. Rogue One: A Star Wars Story is the first anthology movie from Disney and Lucasfilm, which means it takes place outside of the main Skywalker saga. That made it something of a risk, inasmuch as making a Star Wars movie can be a risk, ahead of its release. That risk proved to be worthwhile, since the movie will easily wind up grossing more than $1 billion and should give Lucasfilm confidence to try some different things as they move ahead with these anthology movies in the future. Next up will be the young Han Solo movie, which is due out in 2018 and is currently gearing up for production. If Star Wars: Rogue one was able to outgross Finding Dory with very few recognizable characters, a Han Solo movie should be able to do very well, even without Harrison Ford, considering he is one of the most popular characters in the Star Wars Universe. Nobody was expecting Rogue One: A Star Wars Story to do what Star Wars: The Force Awakens box office numbers did, since it was the first live-action Star Wars movie to be released in a decade and there was a crazy amount of hype leading up to it. Star Wars: The Force Awakens wound up bringing in more than $2 billion at the worldwide box office, making it the third highest-grossing movie ever and the highest-grossing movie that wasn't directed by James Cameron, since Titanic and Avatar are sitting the number two and number one spot currently. While Rogue One did have the benefit of Darth Vader, it largely featured new characters, so it is pretty impressive to see how much interest there is for movies in the Star Wars universe such as this. The fact that Star Wars: Rogue One was able to outgross a sequel to one of the most well-liked Pixar movies ever is undeniably impressive and ultimately should make Disney very happy. The studio wound up becoming the first ever to gross more than $7 billion at the box office in a single year in 2016. That was largely thanks to movies like Finding Dory, as well as Captain America: Civil War, which was the highest-grossing movie worldwide in 2016 ($1.15 billion). Disney also had Zootopia ($1.02 billion} and The Jungle Book ($966 million} to thank for their success. Now that Star Wars: Rogue One has grossed $979 million, that means the top five highest-grossing movies of 2016 all came from Disney, which is truly a testament to their staggering and unprecedented levels of success in recent years.